Our little contribution to Alchimie 2011. 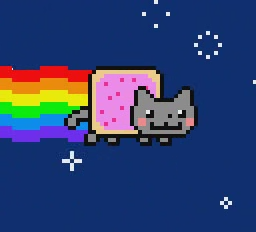 NYAN NYAN NYAN NYAN NYAN!!! NYAN, NYAN! best groupname. only for that. It's for SuperGrafx, not TG16 / PCE. Thumbs up for the platform. This is maybe the third or fourth demo I've seen on SGX.